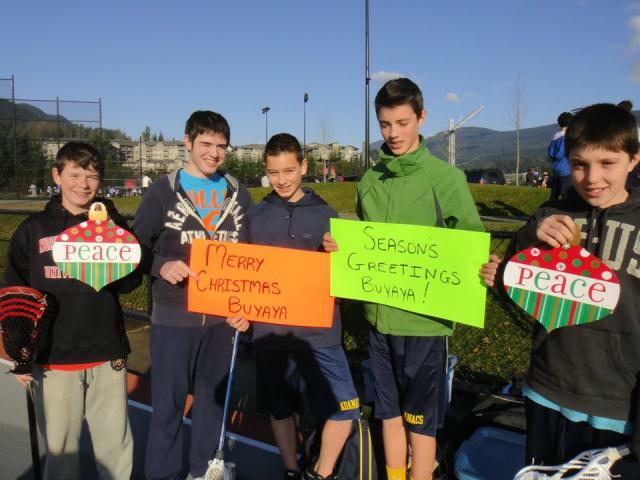 The U14 Coquitlam Adanacs lacrosse team recently raised $500 for a milking cow for Meaningful Volunteer's solar powered school in Uganda. The shelter has been built for the cow, and we just days away from purchasing the cow. The cow will be a high quality hybrid breed and provide many nutrients for the students at the school, including the upcoming preschool program. The cow will be called "Adanac". During some recent games, the team posed for some pictures to wish the village a merry Christmas. These pictures will sent and shown to the people in Buyaya.